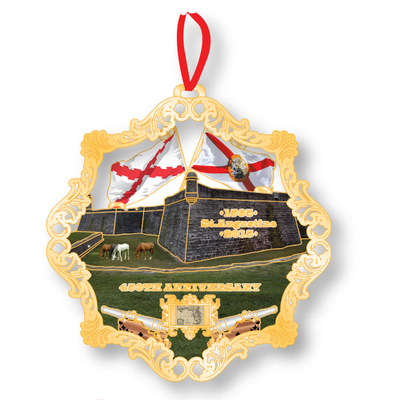 To commemorate St. Augustine's 450th year the Florida Governor's Mansion Foundation has dedicated this year's collectible ornament to our oldest city. Front and center is the oldest masonry fort in the nation, the Castillo de San Marcos. Never taken by an enemy and built from strong coquina stone, there is no other monument to represent the everlasting constitution that is St. Augustine. Resplendent in 24kt. Gold and made in the USA, this ornament makes a stunning gift for family, friends, business associates, and even yourself.